A package arrived on our front porch today. A tiny box, marked fragile, from Stitch Fix. Curious. I hadn't ordered anything from Stitch Fix recently - and this box was too small to be a "fix" - wonder what it could be? Maybe this was a prize, or a thank you for completing that online survey they sent me last week? That must be it. Maybe the fragile stickers are because it's a mug? I would totally drink my morning coffee from a Stitch Fix mug! Great marketing idea guys- yay for a mug! I opened the box and instead of an impersonal mug, I found an envelope with my name handwritten on it.. wow, wasn't expecting that - I guess not very many people filled out the survey. She captured the heart of every person here at Stitch Fix. We wanted to celebrate not only Julia, but the love a mother has for her daughter. We did a little research and found your blog post about the songs Julia loved. When we saw the re-written lyrics for "the song of the one-legged chicken," we knew we had to bring your words to life. 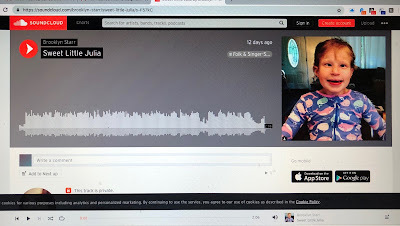 We contacted Nashville musician, Steve Everett, to record your song for Julia. The CD's included all have the song burned onto them. We hope it brings a smile to your face - Julia sure brought a smile to ours. Through bewildered tears, I opened the rest of the package to find a wooden CD holder with Julia's name carved into it along with the a pony and the words "Born with a Possibility." and inside the holder, a CD covered with pictures of Julia with the title "Sweet Little Julia." I followed the link included in the card to the song and stood in my kitchen crying as I listened to Steve Everett sing the words I re-wrote to a children's song about our sweet Jules. My head was spinning, it still is. This was so completely and totally out of left field - to receive such an incredibly thoughtful gift from such an unexpected source... even as I try to write this down now to share it with others, I can't take it all in. Thank you Stitch Fix for this incredibly personal and thoughtful and unexpected blessing. 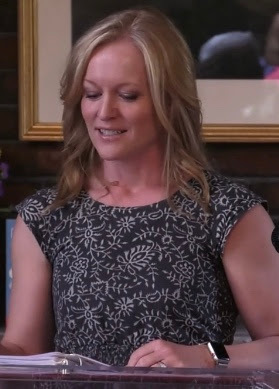 I am so touched and encouraged to hear that you all were moved by Julia's story. As her mom, one of my highest goals has been to spread the word to the world that different isn't wrong. I'm moved to tears and greatly encouraged to know you all agree. 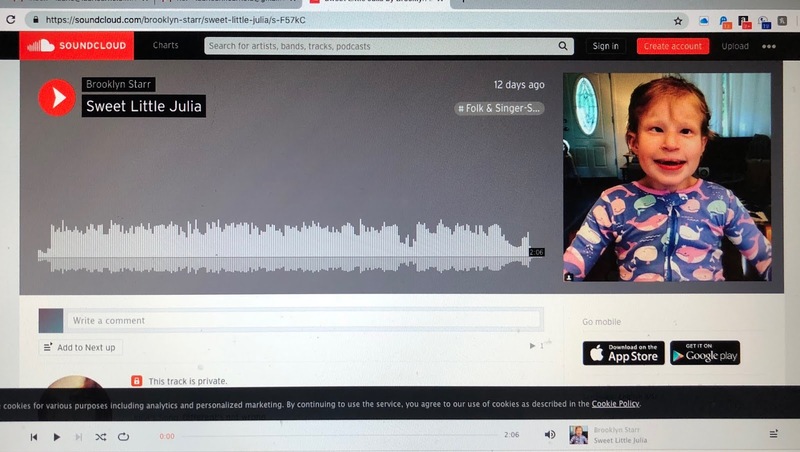 Thank you Steve Everett for sharing your talent in such a generous and loving way - to hear your beautiful voice singing Julia's name is a gift we will always treasure. Thank you for believing this is a message worth sharing - I hope it's a message the whole world will hear. I'm going to bed tonight exhausted from happy emotions, comforted by the thought that there are so many people in the world who see Julia and kids like her as a blessing and a gift. As right and not wrong. In December I turned 39 and decided this would be a really good year to try some new things. One of those new things was auditioning for the Boulder 2018 Listen To Your Mother show. I auditioned with a piece I wrote several years ago called Slumber Parties and Promises, and was thrilled to get a spot in the show alongside 11 incredible women and writers! Due to licensing issues I don't fully understand, the actual show was not recorded, so we did a second reading a week later at the Denver Woman's Press Club and those were recorded. Thank you to the producers of the show: Stephanie Sprenger and Ellen Nordberg, for giving me this opportunity and helping me achieve my goal of trying new things! Last week Julia, my mom and I packed up the car for a last minute, nearly impromptu road trip to Albuquerque (thank you spell check). An opportunity presented itself for Julia to be assessed by a team of cortical visual impairment specialists at the New Mexico School for the Blind and Visually impaired. They needed a few more kiddos to be a party of their new CVI assessment. Our long term Feldenkrais therapist, Ginger, is sister's with one of the women overseeing the assessment and she suggested Julia to them. Yes, was their answer! If we could make it to Albuquerque they would be happy to see her! The only time we've ever met with anyone regarding cortical visual impairment (CVI) was when Julia was two years old. Julia, my mom and I packed up and flew to Pittsburgh where we met with the leading CVI doctor and researcher, Dr. Christine Roman-Lantzy at the University of Pittsburgh. I remember how nervous and excited we were to meet with her and learn more about CVI. Julia was still a very sick little kiddo at that point. Her infantile spasms had just recently been resolved thanks to ACTH, so she was just beginning to awaken from 18 months of daily repeated seizures, super strong meds, and a chaotic brain wave pattern called hypsarrhythmia that destroys development and leaves kids in a zombie like state. During the darkest periods of hyps, Julia was not using her vision AT ALL. Zero visual response. 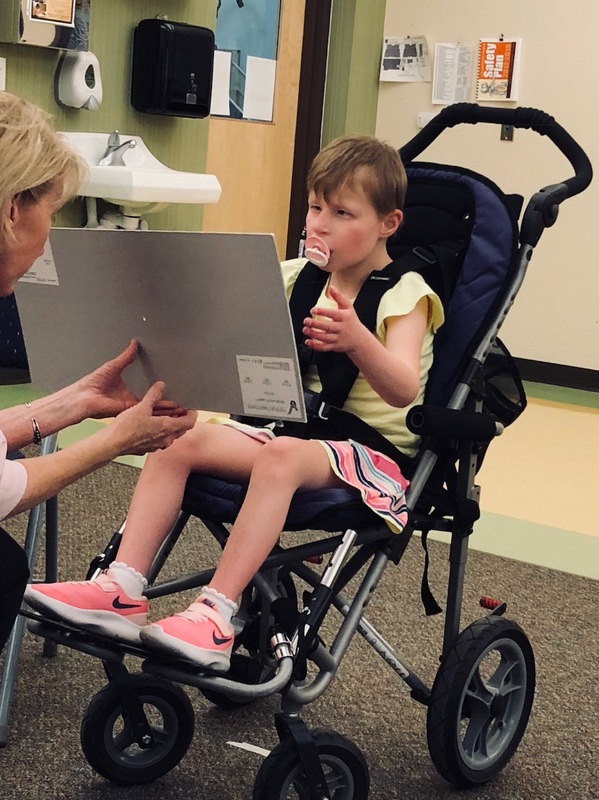 She was a wiped out little girl and after seizures and brain disruption all day every day, she simply had nothing left for vision. As the fog of hyps started to lift, I remember one day Julia was lying on the couch in her bumbo, I reached towards her face to brush her bangs aside and as my hand came towards her face, she flinched. Visual response. WE HAD VISUAL RESPONSE! It felt like a breakthrough! It was in this phase that we went to see Dr. Roman to learn more about what was happening between Julia's brain and Julia's eyes. The main thing I remember about this visit was just how hopeful Dr. Roman was about Julia's potential - not just for vision but for development. She watched Julia with her trained eye, optimistic in her observations, undeterred by chromosome abnormality, a partial agensis of the corpus collosum, and 18 months of infantile spasms. The brain is amazing she told us, it will just keep working to find it's own way... and as Julia's brain finds it's way, so will her vision. We flew home with hope! And in the following months and years as the battle agains epilepsy continued to trend mostly in Julia's favor, we found Dr. Roman's predictions to be true. As her brain healed, her vision followed. The little girl who once had no visual response to anything started reaching for things, picking things up off the ground, maneuvering through her environment with increasing precision and speed. Her vision was not perfect, but she most definitely was using her vision! There are no CVI specialists in Colorado for us to see. So for the past 9 years since our visit with Dr. Roman, we've done our best to support Julia's visual development based on knowledge, advice and information we've gleaned from others. I think we've done a pretty good job, but when this opportunity came up, after all these years, to once again have CVI specialists assess Juila, and help us better understand her, I knew we had to go! We haven't taken a road trip with Julia well, ever. We haven't flown with her since the above mentioned trip to Pittsburgh. We haven't actually left the state with her since the above mentioned trip to Pittsburgh - so this kind of felt like a big deal. But we had to try. The plan was to leave Denver on Tuesday morning, drive 7.5 hours, and arrive in Albuquerque Tuesday afternoon, do the assessment on Wednesday, and drive back Thursday. Julia had a seizure Sunday night. And another one Monday morning. Was this a sign we shouldn't go? Wes pulled up our route to identify all the hospitals along the way. "If you have trouble here or here," he said to me, pointing to the map, "you'll have to use flight for life." Side note: this is how life works with epilepsy - at least our version of it. You try to get brave and do things, like fly to visit your best friend in Arizona, or spend a long weekend at your aunt's cabin in the remote mountains - you think you can do it because things have been steady for awhile - you feel a little brave - and then bam, a seizure strikes out of the blue and all your confidence is gone and you retreat to the safety of your house where a hospital one block away and you can hear the ambulance sirens one minute after you call 911. You decide you don't need to be brave, you don't need to move around and mix things up - you just need to be safe, for her. Just keep her safe. So this was my mindset prepping for our trip on Monday - partly packing, partly preparing what I would say to the people in New Mexico when I called them to say we weren't coming. I'd like to say I had some sort of epiphany around all of this fear and bravery stuff that led me to a clear resolution, some Shawshank Redemption "Get busy living or get busy dying," moment - but I didn't. I just sort of watched Julia all day and since she didn't have another seizure I decided, with definite worry still, that we should go ahead and go. So we did. We left Tuesday morning with our SUV packed to the brim - the stroller and high chair taking up the majority of the space, an abundance of diapers coming in third, followed by toys, food, meds and clothes in that order. I made extra sure to leave the bottle of THC at home -as I did not want this innocent road trip to turn into a felony drug smuggling conviction. The trip went SUPER smooth!!!! I drove, my mom sat in the back with Julia who was a DREAM BOAT! I had stocked the car with every single noise making toy Julia typically likes to play with - but instead she spent the entire ride contentedly holding mardi gras beads and a single strand of gray thread - go figure. We made it to Albuquerque quickly - stopping just once in the booming town of Trinidad, Colorado for lunch. After just a few minor adjustments at our hotel (i.e. requesting to move to a handicapped accessible room on the first floor - I'll remember that next time), we got busy exploring the hotel hallways which are SUPER fun to run down, and went swimming in the hotel pool - which is basically Julia's most favorite thing in life! I won't do a play by play of every moment of our trip - but I will say that we had lots of fun! And none of the things I worried most about - mainly seizures, sleeping and eating in a hotel with Jules - panned out. She did amazing. We arrived at the school on Wednesday afternoon for our appointment. The facility is beautiful! It is only a couple of years old and every part of it is designed for the visually impaired - I wish Julia could spend every day there! We were welcomed by the team and they encouraged us just to allow Julia to explore the room we were in and get comfortable in the space. Julia instantly started running in the open area - happy to be out of her stroller and playing! As my mom and were getting settled and introducing ourselves I could hear the team of teachers already making observations about Julia; how she was moving across the room, whether or not she was tracking objects with her eyes as she threw them in the air, whether she seemed to see where the objects landed, could she find the object again, whether or not she lots interest in an object, how big the objects were she seemed to like... and on and on and on. threw an object that landed between two chairs, they noted she was unable to find it and moved on quickly to something more easily accessible. They moved objects around her head from top down, behind around to the front, bottom up - when did she seem to see the object? At what point did it enter her visual field? Did she have to move her body in order to widen her field? Did she ever seem to move her head for that purpose? They put cards in front of her to see if she responded to contrasting lines. Not so much. A card with a high contrast face? Yes! If the face was faded and was not so high contrast? Nope, lost it. We went outside - she moved with ease through their skillfully designed playground - crossing textures without fear or hesitation. At home she sometimes gets stuck moving across textures, she can't always tell if things are flat or a step. That is common they said - and they thought it was good to see how well she was doing given this play ground was designed to make it easier for kids like her. We could see the difference. The assessment went on for over an hour, Julia started to get tired. She tripped a couple of times and at one point ran straight into one of the teachers who was standing in front of her. She's tired they said - she's not using her vision as much. I found that interesting and thought I should remember that - tired = even less use of vision - got it. We wrapped up - them sharing their thoughts with us and promising to send a full report once it was written up. We thanked them and said we would come back anytime if they ever thought seeing her again would be beneficial. We returned to the hotel, swam and had dinner outside in the lovely New Mexico air. 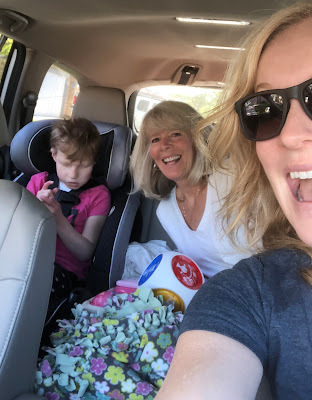 Packed up the next morning and had another successful road trip home - getting fussy only at the end of the trip when we hit Denver traffic - and when I say getting fussy I don't just mean Julia. I asked my mom on the trip back what her takeaways from the assessment were. Together we came up with a few. 1. Julia's field of vision is fairly limited. Put your hands on the side of your eyes and then think eyebrows down to chin - that's about the size of her visual field. Right away I thought of the bonnets worn in The Handmaid's Tale - that's Julia - just minus the awesome bonnet. In order to see more Julia has to move her whole body. If she throws a toy in the air, in order to visually follow it up she has to bend her whole body back, in or to visually follow it down, she tilts her whole body forward. Same when moving side to side. Her body has to move or she loses the object pretty easily. When she is sitting in her stroller or a chair where she is secure she seems to move her head in order to do this - but not if she is standing. 2. The distance Julia can see is fairly limited. Before the assessment I would have said Julia sees maybe 6-8 feet out - but what we learned is that she is really only seeing about 2 to 2 1/2 feet out - beyond that things aren't really registering visually for her. 3. She's moving without seeing. Given the 2 1/2 foot radius she's working with we realize now that most of her movement is without vision. She's moving based on sound and then she might get vision at the very last second. This explains why a lot of times she looks a little out of control when she is moving and I'm worried she's going to crash into something but often at the last second she will make a move and avoid a collision. I'm not sure why I didn't make the connection earlier - but the reason it looks like she's only seeing things at the very last second is because she is actually seeing things at the very last second. The rest of the time she's just sort of picking a direction and heading that way. 4. She NEEDS sound. To go with what I just wrote above, she needs sound to help her maneuver. If she throws a toy and it hits the ground and she starts moving towards it, she's not moving towards it because she can see it, she's moving towards it because she heard where it fell. Which helps us understand why she LOVES things that make loud crashing sounds - the louder the crash the better! Without sound she would not know where to go. Sometimes at home she will move through the house making a loud "Hmm!" sound. To which one of us will respond "Hmm!" back to her. She will adjust her direction, Hmm again, we will Hmm back - and this continues until she finds us. "She's using sonar!" Wes said as I was sharing about the assessment with him. She's like a bat or a humpback whale my mom chimed in! Yes!!!! Our amazing little sonar using girl! For Jules vision is a little bit optional, but sound is a necessity. 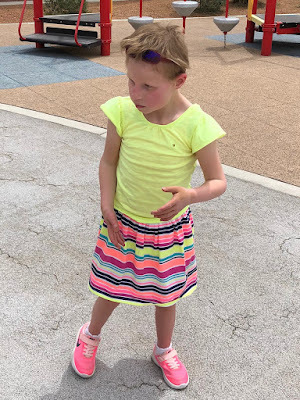 We learned so many interesting things last week about our girl - helpful things that we will take to heart and implement to continue to assist her development. But my overall takeaway, and perhaps my epiphany after all, is this: Julia is so BRAVE. I learned that I have been over-crediting her use of vision. That actually she is using her vision less than I had been thinking over the past several years given how great she has been doing at moving and maneuvering - which in turn means, Julia has been doing a great job at moving and maneuvering these past several years without much help from vision. She just moves. She decides to go and she takes her next step. She moves, she adjusts, she moves, she seeks the input she needs, she moves, she moves, she moves, she keeps moving. And despite unseen obstacles, she is undeterred. Oh to be more like my brave daughter...to not need to see it all to take my next step, to be brave, to keep moving, to just move - because we have places to go!!!! We are stopped at a red light when a car behind us honks. A car beside us honks twice in response. Another car honks, then another and another. We are surrounded by a frenzy of honking cars but the reason for the honking is not clear to me, nor to my driver, as evidenced by the fact that we are both swiveling our heads around from side to side and front to back, trying to find the cause of the honking. The light turns green. My driver proceeds with the route, while I proceed to process the wisdom she just dropped on me – wisdom that was way less about how to navigate the literal “honkers” on the streets of New York City, and much more about how to navigate the metaphorical “honkers” on every single road of life. For reasons that may not be clear to me, nor do they need to be, the honkers are nervous. And uncomfortable - because nervous is usually pretty uncomfortable. So the nervous get noisy, and start honking. Because for a moment honking makes us feel tough. And feeling tough, even for a moment, can sometimes feel better than admitting we feel nervous. But what I was reminded of in the back seat of my Uber on my way to JFK, is that the next time I'm surrounded by honking, I have to remember that the honking is about the honkers, it has nothing to do with me. The nervous honkers do not need a honk from me in response to their honking. They sure as heck don’t need TWO. That won’t solve any problems. It definitely won’t stop the honking.